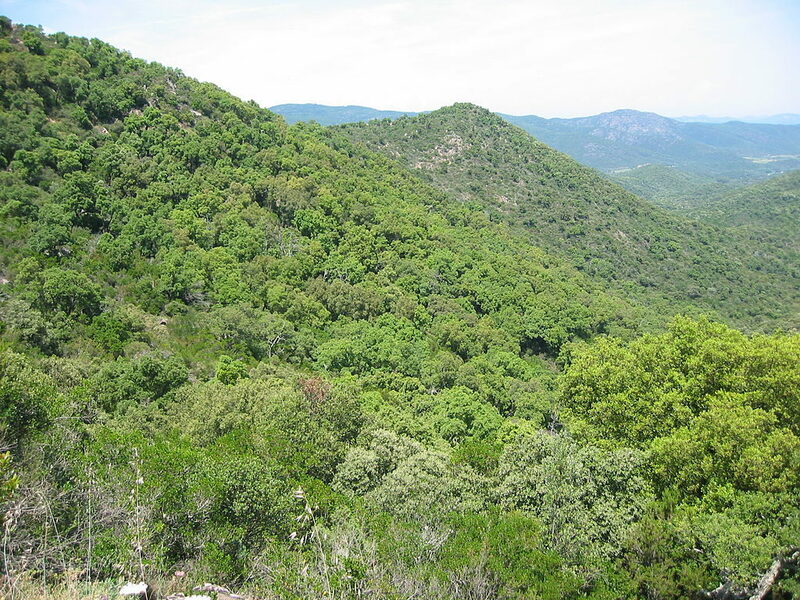 Located a few kilometres from Camping de La Pascalinette®, the Massif des Maures is a small mountain range in the Var area, between Hyères and Fréjus. Its name has changed several times over the centuries: Montem Maurum, Maura, La Maura in 1529 and Las Mauras de Bormettas (Les Bormettes… does the name sound familiar?). Historians and linguists more or less agree that the original meaning of the name is “black mountain”, first used in the singular (La Maura in Latin and Provencal dialect), then in the plural as the range features several mounts. The name “Maure” is found in both Provencal dialect and ancient French. Set overlooking the Mediterranean Sea and stretching from St Raphaël to Hyères, the Massif des Maures spans 334,000 acres (60 km wide and over 130 km long), and rises to an altitude of 780 m near Notre-Dame-des-Anges, at “Signal de la Sauvette”. The view from the top is breathtaking and spans the Golden Islands, Giens peninsula, the Bay of Hyères and St Tropez. Several charming, typically-Provencal villages surround the Maures: Collobrières, La Môle, La Garde-Freinet, Plan-de-la-Tour, Gassin and Ramatuelle. On the coastal side, you’ll find many little towns and villages built on its pretty slopes, such as Bormes-les-Mimosas, Le Lavandou, Le Rayol, Cavalaire-sur-Mer, Saint-Tropez, Sainte-Maxime, etc. Running between Le Lavandou and St-Tropez, the Corniche des Maures coast road is truly stunning. You can tour the Massif des Maures by car via the Route des Crêtes (from Le Rayol), but it may be partially closed in summer due to forest fire hazards. If you’re on foot, the GR 51 long-distance footpath also runs along the Route des Crêtes. 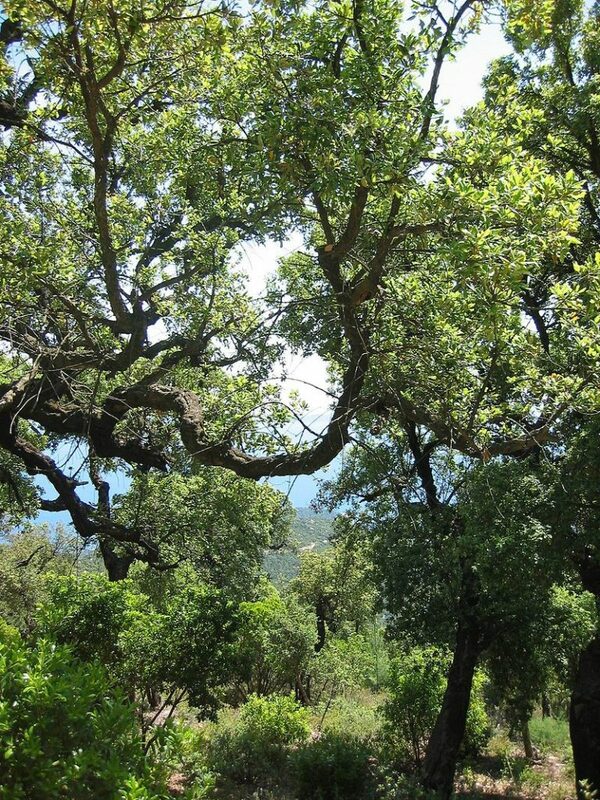 The Massif des Maures is home to a particularly rich animal life, including species also found at the campsite, such as the protected Hermann tortoise, together with wild boars, badgers, martens, hares and bats. In summer, you’ll come across reptiles such as lizards, vipers, etc. together with nocturnal and diurnal birds of prey (also protected) including the harrier eagle, burrowing owl and eagle owl. Home to many indigenous chestnut trees, the Massif des Maures and especially its capital, Collobrières, is reputed for its chestnuts (and candied chestnuts and chestnut jam). You’ll also find lots of cork oaks there (especially in the northern area) and rich and varied vegetation including maritime pines, umbrella pines, heather and arbutus (to the South). Cork oak reigns here – this hardy tree is capable of springing magically back to life even after a forest fire as it is protected by its thick bark. It is partially thanks to the cork oak that forests devastated by fire in recent years have survived. During your walk you will also be able to admire veteran trees along with baby oaks and evergreen oaks. In Spring, beautiful Maures lavender blooms here, alongside everlasting, broom and even narcissi and asphodelus.The Massif des Maures: a haven for walkers, hikers, riders and mountain bikers, just a stone’s throw from your favourite water park!